In order to apply for an intership for 2016, a teacher has to hurry up and send in his or her application through the Rossotrudnichestvo site by April 1. On the eve of the Moscow International Education Salon 2016 (April 13-16), Russian Deputy Minister of Education and Science Veniamin Kaganov talks to RBTH about a special program for Russian-language teachers, and how a portal promoting Russian is developing. In 2013 the Russian Ministry of Education and Science launched a program to promote the Russian language abroad. Within the framework of this program, the Pushkin Institute of the Russian Language inaugurated the ‘Education in Russian’ portal in 2014. The portal not only offers a course in the Russian language for all levels, but it also has programs to improve one's qualifications to teach Russian as a foreign language (RFL). Russian Deputy Minister of Education and Science Veniamin Kaganov spoke to RBTH about the progress of the portal. RBTH: You are the director of the program promoting the Russian language. How is it evolving? Better than we expected. People from more than 176 countries are using our portal. We have more than two and a half million visitors and about 400,000 active users. This month more than 60 new courses have been introduced on the portal. Now our objective is not just to continue expanding this resource, but also to make it noticeable around the world. 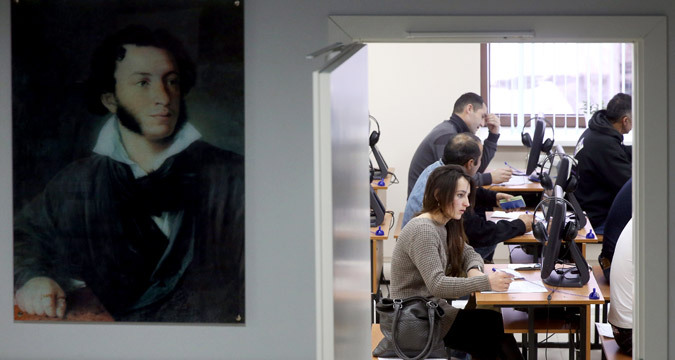 We are thus discussing the possibility of creating a network of university-partners of the Pushkin Institute of the Russian Language that could conduct courses and tests in various countries. RBTH: How can a RFL teacher receive method training in Russia? The easiest way is to register on the ‘Education in Russian’ portal and sign up for a free online course to raise his or her qualifications. More than 4,500 people have already done so. The portal offers several thousand hours of lectures dealing with all the methods of teaching the Russian language. Registered users come in direct contact with the methodologists from the Pushkin Institute, since tutors begin working with the RFL teachers at a certain stage of the training. Furthermore, Rossotrudnichestvo (a federal agency that promotes Russian soft power abroad) offers quotas for RFL teachers to come to Russia and do an internship. However, in order to make it for 2016, a teacher has to hurry up and send in his or her application through the Rossotrudnichestvo site by April 1.